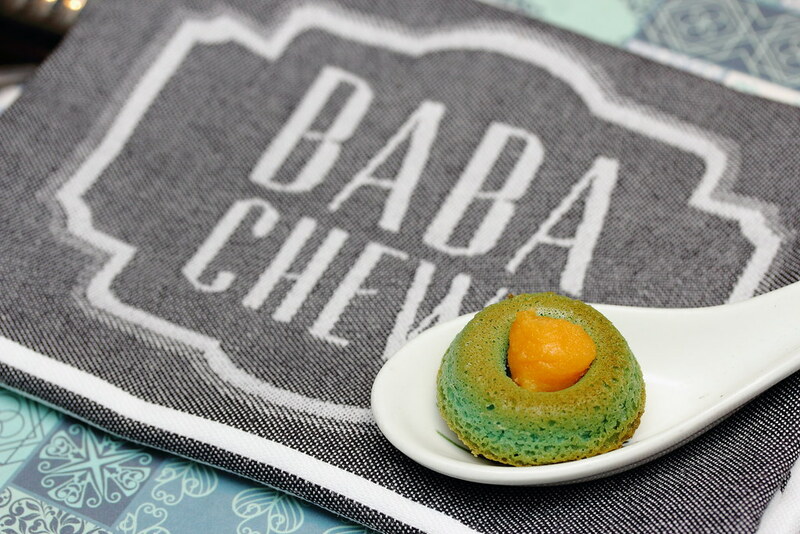 Occupying the former Joo Chiat Police Station is a new dining place, Baba Chews Bar & Eatery. Located inside an old conservation building with colonial and Peranakan elements, the restaurant offers a marvel of grubs influenced by cuisine across the Straits of Malacca. We started the dinner with some keropok that comes with a chilli sauce dip and satay sauce like dip. 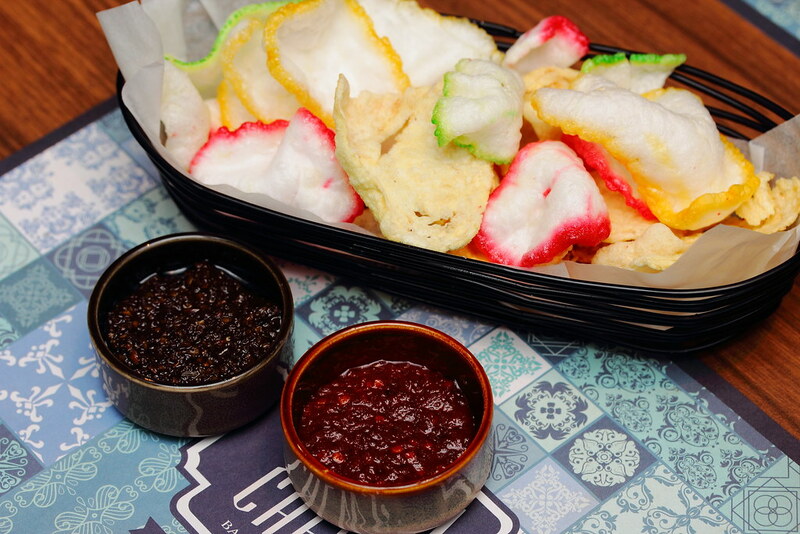 The chilli sauce dip is rather spicy so go easy with it. Made from 3 different types of nuts, using peanut, pecan and walnuts, the satay sauce like dip is quite addictive. 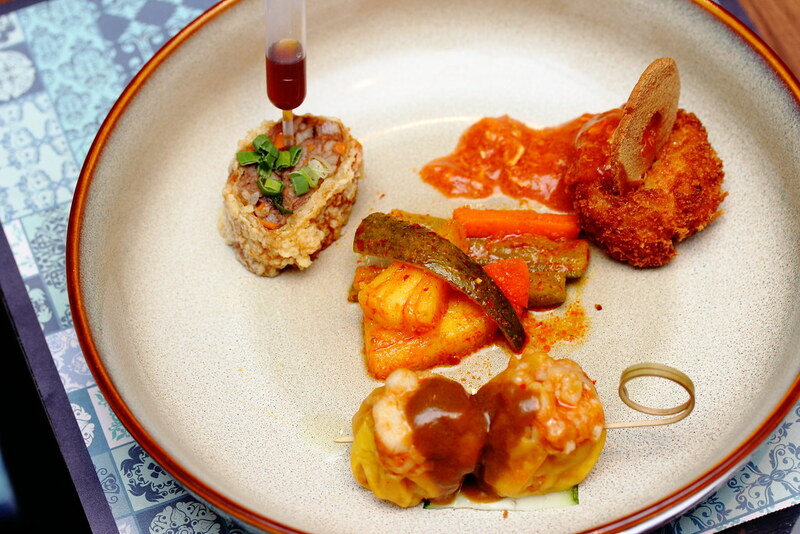 On my sampling plate, there is the Otah Siew Mai, Five Spice Ngoh Hiang, Chilli Crab Cake and Achar. Do kindly note that this not the actual portion. It like the idea of the Otah Siew Mai dressed in a prawny flavoured sauce. It has never come across my mind that we can incorporate both otah and siew mai into a dish. Not to be missed is the Five Spice Ngoh Hiang that is wrapped in a thin beancurd skin and fried to golden crisp. I enjoyed so much that I ordered it again during my re-visit. 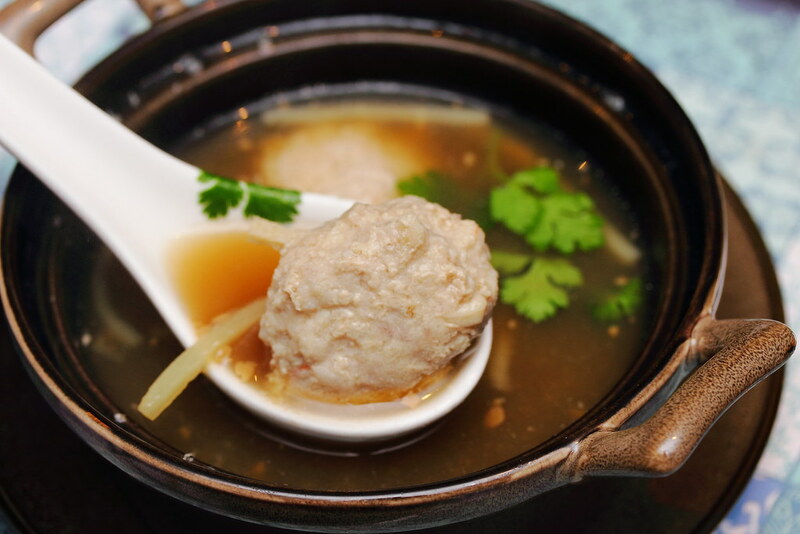 Pong Tauhu ($9) is a traditional Peranakan soup with homemade prawn stock, pork meatballs and bamboo shoots. The pork meatballs may appear to look like a huge tough rock but it was actually very soft. If I am not wrong, the minced meat is mixed with tofu before shaping into the round meatball, hence the wonderful texture. 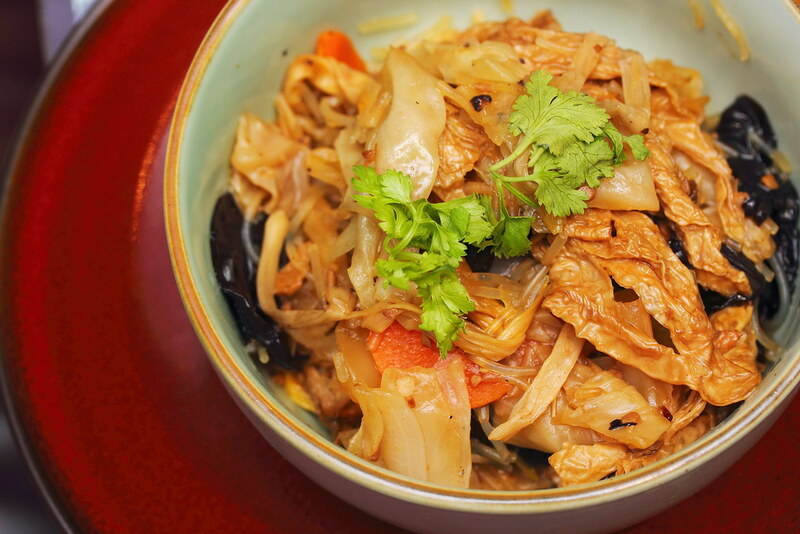 A dish that I always order when I have Peranakan food is the Chap Chye ($12). The Peranakan mixed vegetable stew is a dish that will determine the standard of the nonya food for me. The vegetable were not too soft but still retained a crunch to it. Fermented bean can be quite acquire in taste but this is nicely balanced not overpowering instead complementing it. The Barramundi Goreng Chilli ($29) is a dish that I would not order normally but it turned out to be a wise decision. 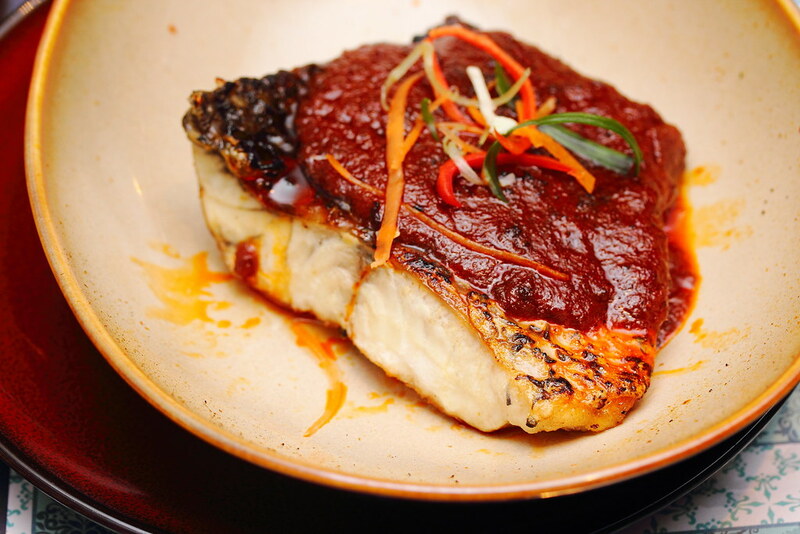 The pan fried seabass fillet is coated with homemade sambal chilli that added a coat of shine to the moist texture of the fish. I have enjoyed the dish and ordered again during my second visit with my foreign friends. 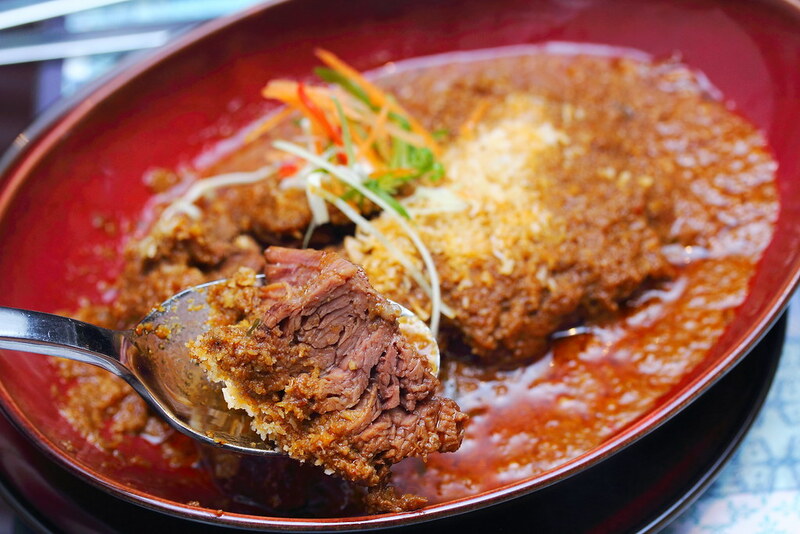 A signature at Baba Chews is the Beef Short Ribs Rendang ($25). The beef short ribs were stewed in a rich gravy of coconut cream, spices, gula melaka and turmeric leaf. During my visit the texture was a bit tough but on my second visit, the texture was really tender. Not to mention the delicious rempah that worked the beef short ribs beautifully. The dessert menu maybe small but its not to be missed, especially the Kueh Durian ($12). 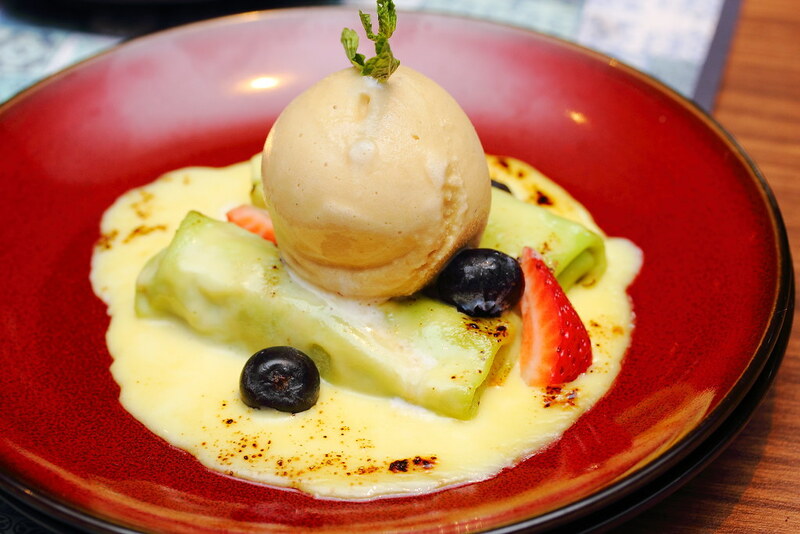 Chef has cleverly took the traditional kueh dedar, wrapping the pandan crepes with a variation of homemade durian mousse and shredded coconut cooked in gula melaka. 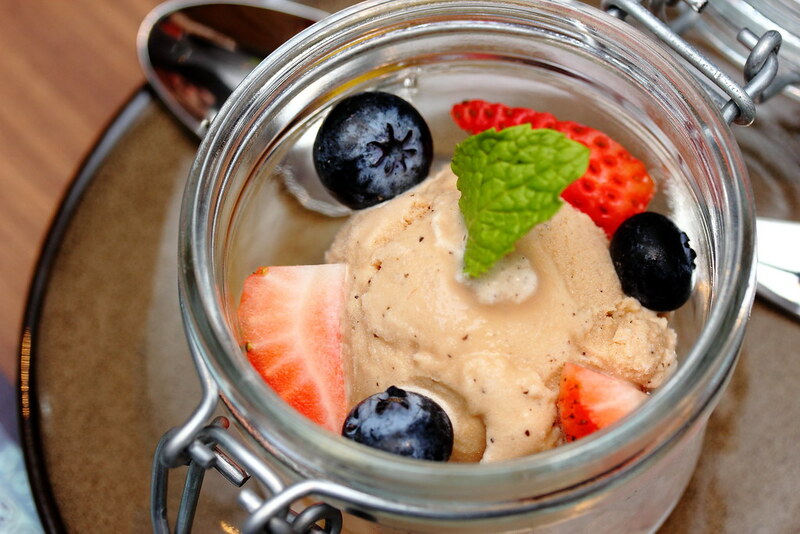 This is topped with a scoop of homemade gula melaka ice cream. The interpretation has definitely elevated the whole enjoyment of a traditional dessert. Besides the All Day Dining Menu and Dinner Menu, Baba Chews also offers a Weekend Brunch that consists of an A La Breakfast Carte Menu of Continental, American and Asian breakfast staples, as well as a breakfast semi-buffet option priced at $28++ per person. Staying true to its café identity, Baba Chews also serves up coffee that are carefully crafted with roasts by Common Man Coffee Roasters, making it first in its neighbourhood to offer this option. A selection of TWG teas is also available on the menu, catering to diners who prefer tea to a cup of joe. why did u remove the links on the sidebar?